Samsung Galaxy S5 – done. The All New HTC One – almost done. Apple iPhone 6 – let the concepts, leaks and expectations keep coming! This is March and like every March we are literally swarmed by everything smartphone. All the major tech companies either roll out their flagships or start talking about them. If not, then the web does the work for them. While iPhone 6 launch is still a many good months away, the leaks and concepts keep coming. Some are good, some rather absurd and others seem like designed by someone extraterrestrial – no offence. The current iPhone 6 concept that we are talking about follows people’s expectations of Apple going to a redesign phase for the upcoming flagship. It doesn’t sound realistic keeping in mind that the company being talked about is Apple which likes keeping things as they are. But the suggestions aren’t too off the beat. Released by TechRadar, this new iPhone 6 concept takes a traditional approach to Apple’s flagship only adding a few significant improvements on top of the iPhone’s current design. TechRadar’s iPhone 6 concept keeps the basic distinctive iPhone design but with a slightly more rounded form. It expects the iPhone 6 to be a bit thinner and the Home button getting replaced by a button-less Touch ID which will work with a tap. This way fingerprint sensor will be more accurate helping Apple to ease off disgruntled customers of iPhone 5s. iPhone 6 concept by TechRadar is a 4.7-inch high-res (1080 x 1920 pixels) and sports a bezel-free design. This design is expected to help phone handling with one hand easier. The display will be Sapphire and will also have a self-healing coat. The latter tech is perhaps inspired by LG’s G Flex smartphone which is capable of healing itself from minor scratches and thus keeps the device safe from everyday roughness. Apart from a Sapphire screen, and self-healing capabilities, TechRadar’s iPhone 6 expects Apple to have a 13 megapixels camera with a light flash; the concept calls it the best iPhone camera ever. 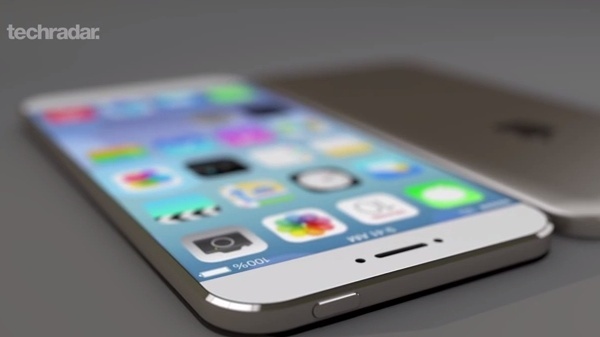 Apple is expected to launch its iPhone 6 sometime in the fall. With the start of iOS 8 leaks, seems like iPhone 6 launch may coincide with that of iOS 8 public release too.